This is Lamar Jackson's spot on the blog, he lives here now. And sure, the returns weren't quite what we had hoped last week, but I'm going back to the well. Jackson continues to struggle to get to even his second read, and was turnover prone last week, but once again, his rushing yards provide the ultimate floor for a bargain QB option. The big draw this week is a Chiefs defense that is absolutely atrocious and dead last against the pass. There will be first reads wide open in this game, expect Jackson to bring in good returns. With Matt Breida out with an ankle injury, it appears to be Jeff Wilson Jr's time to shine in San Francisco. He has performed admirably so far, handling 23 touches for 134 yards (and one fumble) in his Week 13 game against an above average Seattle defense. Denver has been playing better, but still rates in the bottom third in both passing and rushing defense, meaning there will be fantasy points to be had. His status as an unknown commodity has depressed his value, but Wilson should be a high floor/high touch asset on Sunday. Welp, FanDuel didn't account for James Connor injury so everyone and their mother is going to have Jaylen Samuels on their roster at this price. Samuels has shown the ability to be a three down back, if only an average one, and should see about two thirds of the work over Stevan Ridley. I expect a solid day for Samuels against the porous Oakland defense, and certainly one that far out paces the $4,600 valuation. The biggest question you have to ask yourself is whether you are going to differentiate from the crowd by not using Samuels. Ah the beauty of football. One week you are hauling in ten catches for 157 yards and a touchdown, the next week you drop the only pass thrown your way. 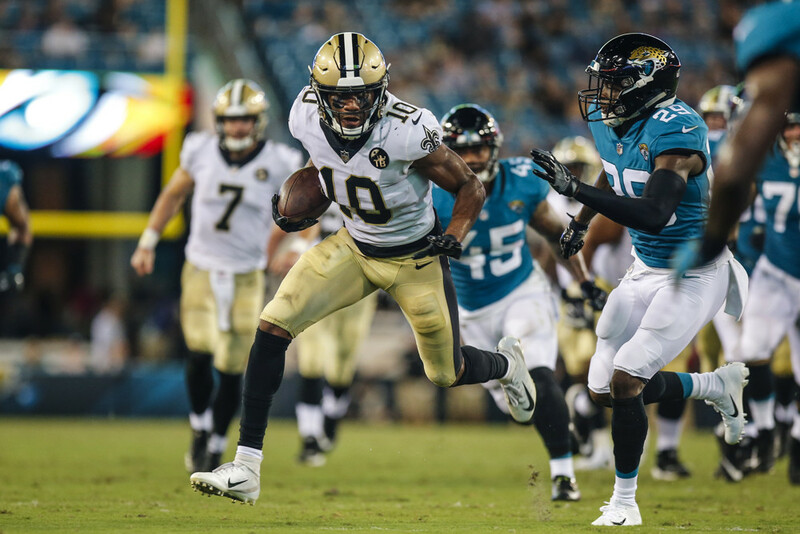 And while you normally don't want to rely on anyone putting up goose eggs, Tre'Quan Smith was averaging over 5 targets a game before the disaster in Dallas. The matchup this week is about as friendly as it can get with the Buccaneers and the poor game last week knocked some dollars off his valuation. Smith makes a nice upside pick. Courtland Sutton promptly caught 1 pass the last time I recommended him, so it's time he repays the readers of this blog. That and with Emmanuel Sanders and Jeff Heuerman injuries, there is simply no one else half way decent to pass the ball to. So here we are, Courtland Sutton, volume receiver by default. He continues to be inefficient but it would be a shock if he saw less than 8-10 targets in this one. That is something you can work with. Ah yes, the section where I tell you not to pick a bargain tight end. Seriously, this last part of the blog has been an absolute blood bath in 2018, and if you aren't locked into one of the top 3 tight ends, I think you are making a mistake. But for differentiation sake, if you reeeeally need a bargain play, I'll get you the cheapest player with the most upside. That is Ian Thomas. Thomas is an intriguing prospect out of Indiana that has shown some promise in the Carolina offense. Everyone knows that Cam loves him some tight end, and Thomas was actively involved last week. He definitely has the most bang for the buck.